Home / Car Audio / 1. Head Units / Features / Works with Pandora Radio / Alpine iLX-007E – 7″ Touch Screen Apple CarPlay. 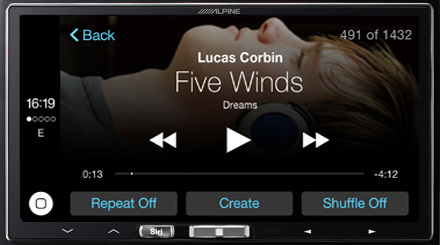 By Far our most popular Apple Car Play Head Unit, the innovative Alpine iLX-007E in-dash system with Apple CarPlay brings you a smarter way to use your iPhone on the road. The innovative Alpine iLX-007E In-Dash System with Apple CarPlay brings you a smarter way to use your iPhone on the road. Apple CarPlay gives iPhone users an incredibly intuitive way to make calls, use Maps, listen to music and access messages with just a word or a touch. 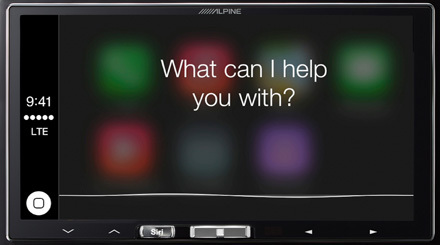 When Apple CarPlay is used on the Alpine iLX-007E, users can control Apple CarPlay from the 7-inch screen or activate Siri for minimised distraction. 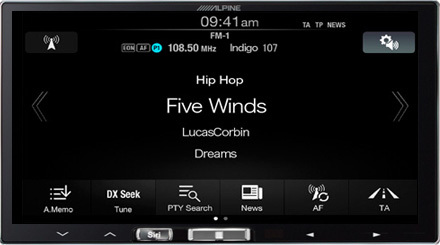 Connect your compatible i-Phone smartphone to the Alpine iLX-007E headunit and you immediately have access to making/receiving phone calls, SMS messaging , navigation and playing your favourite music all via the units 7” capacitive touch screen. You can also even enjoy Spotify, internet radio or Podcasts while on the road for a truly connected experience. When Apple CarPlay is used on the Alpine iLX-007E, users can control Apple CarPlay from the 7-inch high-resolution display or activate Siri for minimised distraction. 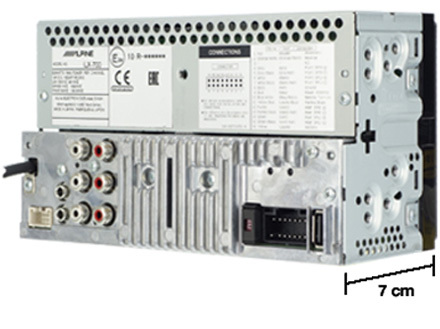 * Note: For AUX input unit requires an Alpine KCE-250iV or Add an Alpine DHA-S690 6 Disc DVD/DivX/MP3/WMA/AAC Changer. 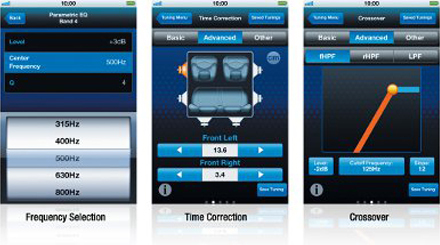 Looking for a safe way to enjoy the best of your iPhone® while you drive? 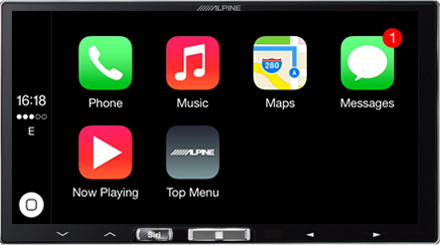 Alpine designed their iLX-007E digital media receiver to work specifically with Apple CarPlay, so you can access the apps you need without getting distracted from the matter at hand – driving your car. The innovative Alpine iLX-007E In-Dash System with Apple CarPlay brings you a smarter way to use your iPhone on the road. Apple CarPlay gives iPhone users an incredibly intuitive way to make calls, use Maps, and listen to music and access messages with just a word or a touch. 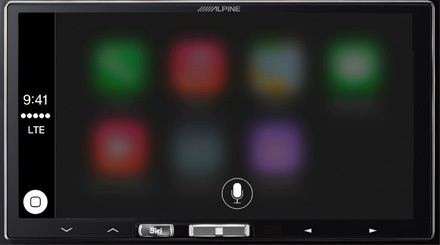 When Apple CarPlay is used on the Alpine iLX-007E, users can control Apple CarPlay from the 7-inch screen or activate Siri for minimized distraction. 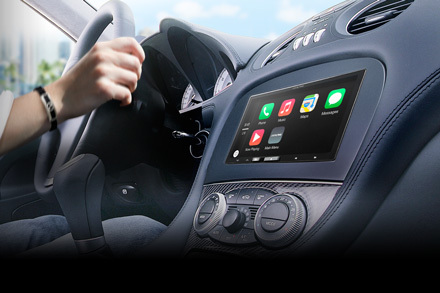 Apple CarPlay is compatible with iPhone 5S, iPhone 5C, Phone 5, iPhone 6 or iPhone 6 plus running iOS 7.1 or higher. You can also even enjoy Spotify, internet radio or Podcasts while on the road for a truly connected experience. 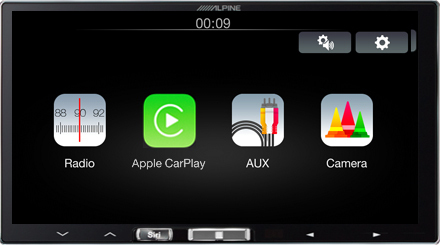 When Apple CarPlay is used on the Alpine iLX-007E, users can control Apple CarPlay from the 7-inch high-resolution display or activate Siri for minimised distraction. Responsive To The Touch Through its 7″ Capacitive Touchscreen the Alpine iLX-007E is designed for use in the car with your iPhone through Apple CarPlay. Conveniently located volume, track, home and Siri hard keys are accessible for quick access and simple control. The Alpine iLX-007E is a SWRC Ready Head Unit (Steering Wheel Controls) add an Alpine SWR-C-20, to interface this unit with compatible factory Steering Wheel controls. 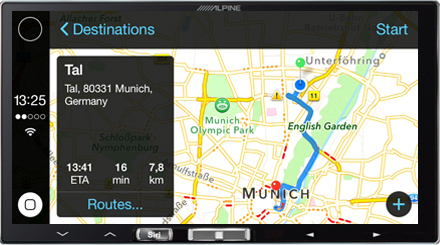 Alpine iLX-007E, iPhone and Apple CarPlay — a brilliant combination. Apple CarPlay offers a safe and intuitive way to use your iPhone in your car. 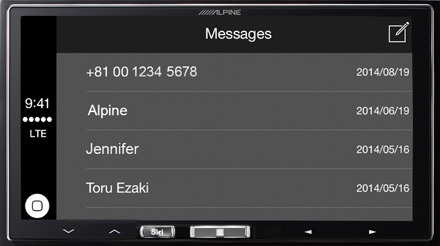 Simply connect your iPhone to the Alpine iLX-007E through the lightning connector and the Apple CarPlay apps appear on your Alpine screen. Use the the 7” capacitive touch screen or Siri to get driving directions, make calls, browse though your music library and dictate SMS messages – or have Siri even read new incoming SMS messages to you. Additionally there are more Apple CarPlay approved apps such as Podcasts, Spotify, internet radio and others – and the list keeps growing. Apple CarPlay allows you to use all these apps while keeping your eyes on the road. Below we explain the these key apps in more detail.When you stop your car and engage the parking break you get additional option such as a keyboard to manually input navigation destinations. 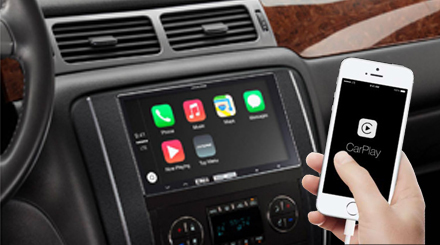 The innovative iLX-007E In-Dash System with Apple CarPlay brings you a smarter way to use your iPhone on the road. Apple CarPlay gives iPhone users an incredibly intuitive way to make calls, use Maps, and listen to music and access messages with just a word or a touch. 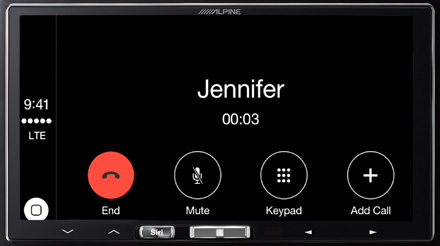 When Apple CarPlay is used on the Alpine iLX-007E, users can control Apple CarPlay from the 7-inch high-resolution display or activate Siri for minimized distraction. 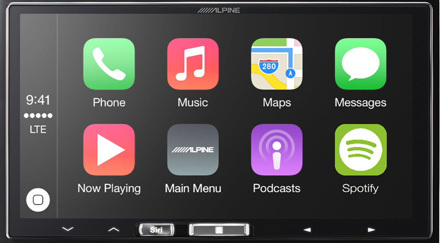 Alpine iLX-700E, iPhone and Apple CarPlay — a brilliant combination. Apple CarPlay offers a safe and intuitive way to use your iPhone in your car. 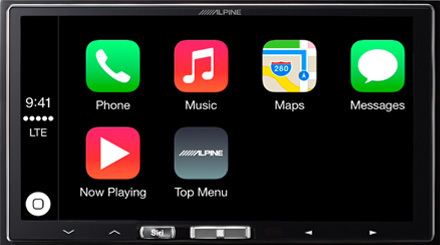 Simply connect your iPhone to the Alpine iLX-007E through the lightning connector and the Apple CarPlay apps appear on your Alpine screen. Additionally there are more Apple CarPlay approved apps such as Podcasts, Spotify, internet radio and others – and the list keeps growing.Apple CarPlay allows you to use all these apps while keeping your eyes on the road. 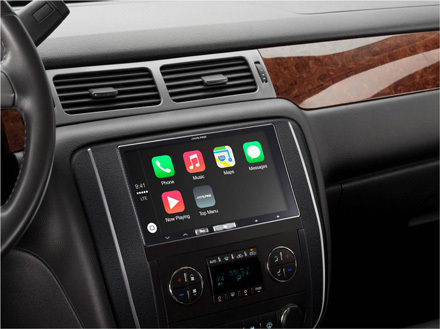 Apple CarPlay seamlessly integrates with your iPhone for greater operating ease and functionality. Use Siri to make calls, return missed calls and listen to voice mails, keeping your eyes on the road. 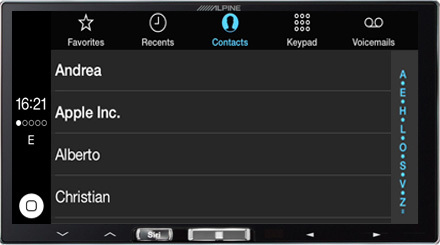 es and Recents lists, a Keypad display and an easy-to-use Call Screen. 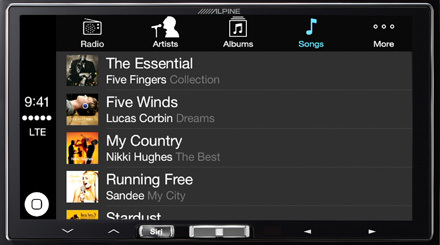 You can control all the music search options of your iPhone directly from the Alpine iLX-007E. Search playlists, artists, albums, songs, and more by scrolling or via alphabetic search. You can also activate Siri to play music by giving voice commands. The USB connection ensures superfast access and high-quality sound. Wherever you go, let Apple CarPlay show you the way. The utter simplicity of Apple Maps will guide you through turn-by-turn spoken directions, interactive 3-D views, traffic conditions and estimated travel time – all from your dashboard. When you start to input an address, Apple CarPlay will use various information to quickly predict the destination. Enjoy a better way of text messaging with friends and family with Apple CarPlay when you’re on the road. Through your voice commands, Siri can do all the heavy lifting by sending, reading and replying to your text messages so that you never have to glance at your phone while behind the wheel. Apple CarPlay uses Siri voice control specifically for driving scenarios. Tell Siri what you’d like to listen to and Siri will be on it. Want a text message read or sent? Siri has that handled. Have calls to take and return on the road? Siri is the perfect co-pilot for that. Siri can seamlessly be activated from the dedicated hard button on the Alpine iLX-007E and on your steering wheel controls (if applicable). The Alpine iLX-007E will fit in most vehicles with its very low installation depth of only 7cm. 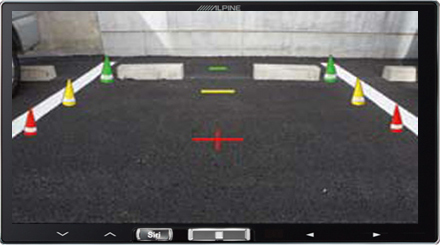 It allows installation in VW Golf 7, BMW Series 1, BMW Series 3 and other vehicles with shallow 2DIN installation depth.